Dirk Vander Kooij is set to unveil a new line of “Endless” furniture made from recycled e-waste at “The Future in the Making”, an exhibition organised by Domus that will take place during Milan Design Week 2012. The young winner of the 2011 Dutch Design Award has reprogrammed an old industrial robot to extrude electrical appliances into chairs and tables. Vander Kooij, who until now has focused on synthetics, will present a new and different range of materials in Milan. The Endless robot uses ground-up plastic from old refrigerators and squeezes it in a continuous thread, layer by layer, to form pieces of furniture. 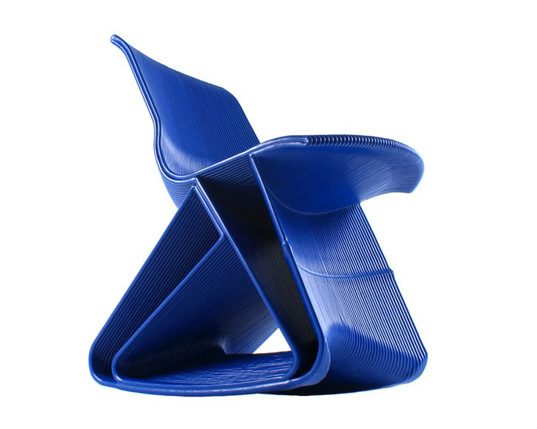 This kind of low-resolution 3D printing can produce a chair in just 3 hours. The technology also enables the designer to modify a model after a piece of furniture is produced – a bonus that the traditional injection moulding process doesn’t offer. 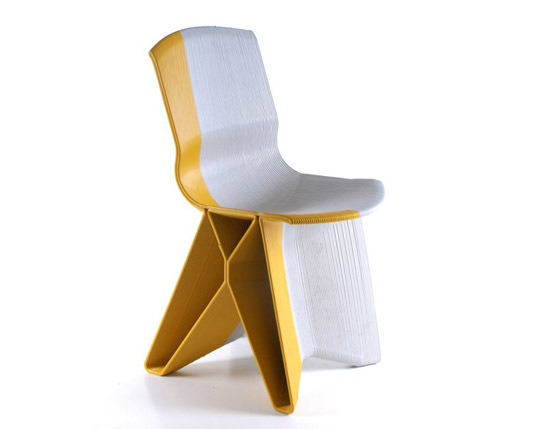 The machine can be programmed to build furniture of any shape and size. “The Future in the Making” is an exhibition presented by Domus and Audi at the Palazzo Clerici in Milan during the 2012 Milan Furniture Fair, from April 17-22. The event looks at the future of design and has invited a new generation of innovative designers to exhibit their work. Other designs at the exhibition include Markus Kayser‘s Solar Sinter – a numerical control machine designed to construct objects using only solar power and sand as a raw material. Dirk Vander Kooij is set to unveil a new line of "Endless" furniture made from recycled e-waste at "The Future in the Making", an exhibition organised by Domus that will take place during Milan Design Week 2012. The young winner of the 2011 Dutch Design Award has reprogrammed an old industrial robot to extrude electrical appliances into chairs and tables. Vander Kooij, who until now has focused on synthetics, will present a new and different range of materials in Milan.